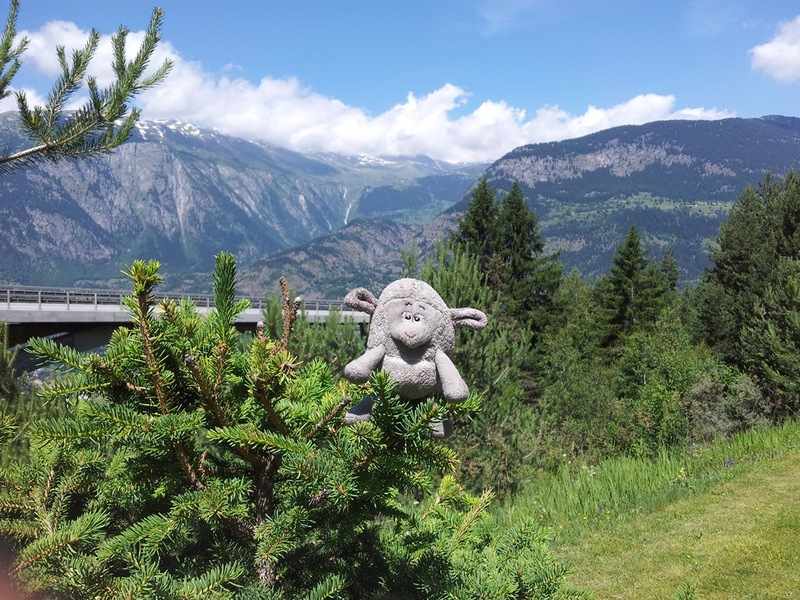 Helen and I have just returned from a tour around the French Alps. We covered approximately 3,300 miles in total and visited six different countries on the way. Surprisingly, considering how many borders we crossed the only people to check our passports were the UK border post at Calais on our return. To put in context how high we have climbed on the mountain passes this trip. Ben Nevis the highest mountain in the British Isles is only 1344m high. 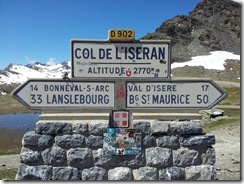 Two of the passes we went over Stelvio Pass and Col de l’Iseran are both over twice this height. We left home at around 8:00am, the sky was still very dark and cloudy and the roads were wet, but it wasn’t raining. On the way down to Mottram we encountered a little bit of rain and spray on the motorway, but nothing of real note. 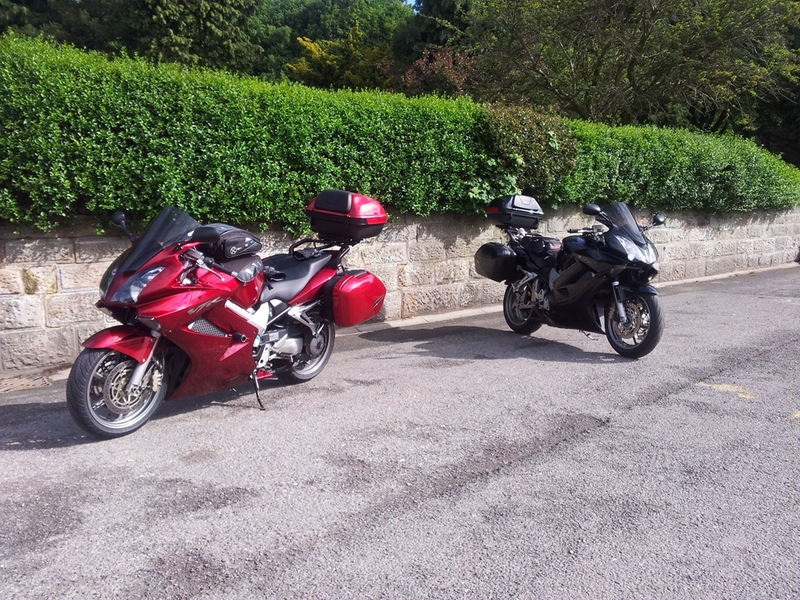 We took my sneaky way around Hadfield and Glossop, via Broadbottom and joined the A624 to Chapel en le Frith. We joined the A6 there and headed into Buxton. We took the A515 out of Buxton towards Ashbourne. This is a nice flowing road but is spoilt by the unnecessary 50mph speed limit. We soon arrived in Ashbourne and stopped just on the outskirts to use some facilities we have stooped at before. We left Ashbourne on the A515 again and headed for Lichfield. Again a nice road spoilt by the stupid 50mph limit. Just before getting to Lichfield we turn left onto the A513 at Kings Bromley. We followed this road to Tamworth because it was Sunday it was fairly quiet. 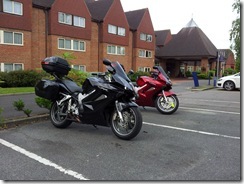 We passed through Tamworth and then joined the A5 and headed for Milton Keynes. Not a great road but far better than going on the M6 and M1. As we came near to Towcester the Sat Nav warned of a 10 minute delay, presumably this was for traffic going to Silvertstone for MotoGP. Mrs TomTom soon came up with a new route to by-pass the traffic. We went through Towcester then cut through a housing estate and onto a tiny road that wound its way to the A413. We then passed by Silverstone to the East, passing a sneaky back entrance to the track. We followed the A413 to Buckingham and stopped there at a Tesco to fuel up and have lunch. We left Buckingham on the A413 again and headed for Aylesbury. We left the A413 at Whitchurch and went on to minor roads to avoid going through Aylesbury. We took these roads through some very nice villages to the M40 at junction 6. We then followed the M40 to the M25 and then headed South past Heathrow. Just after Heathrow we hit some congestion that the Sat Nav had already informed us about. So we had to filter past all the near stationary traffic for several miles. We eventually passed all the traffic and then left the M25 at junction 6. We then went on the A22 and A25 to Limpsfield. Here we joined the B269 to Crockham Hill and then the B2026 to Edenbridge. 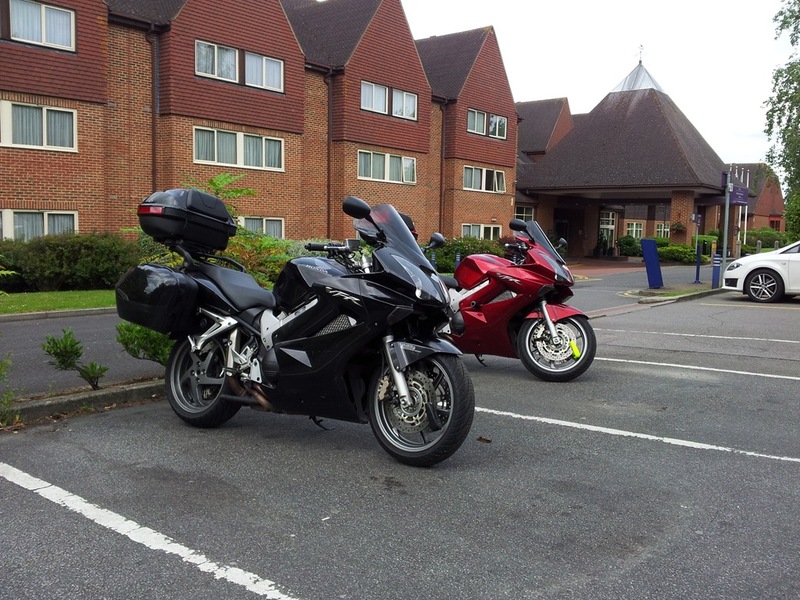 We then joined the A264 to Royal Tunbridge Wells and continued on the A264, A21, A262 and A28 to Ashford. Although these roads were better than going on the M25/M20, it was very hard going (poor drivers galore). We soon arrived at our hotel for the night (The Ashford International, QHotel) and the sun had even come out to welcome us here. We awoke this morning to the sight of rain and wet roads. 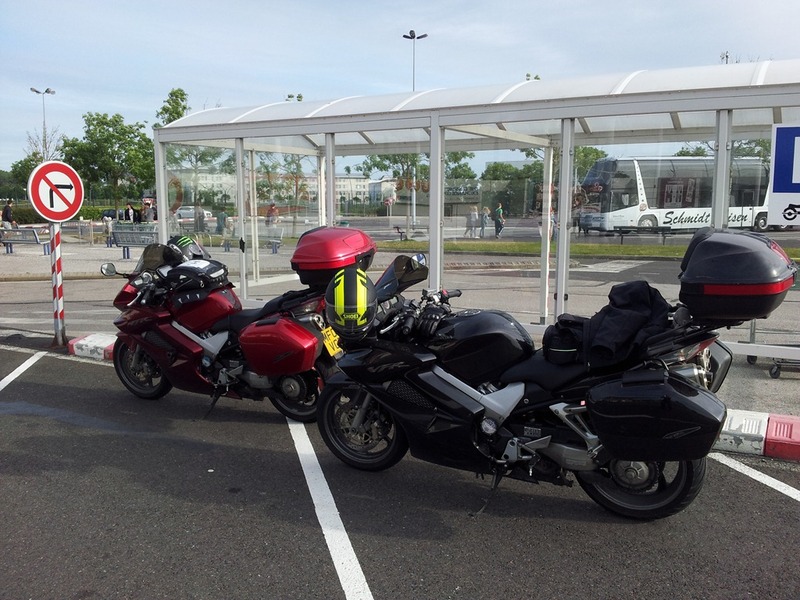 However after breakfast it had stopped raining and so we dried off the bikes and packed up and set off for the Eurotunnel (Channel Tunnel). We arrived in within 20 minutes of leaving the hotel and in plenty of time for our 09:20 train. It was pretty quiet and it was very easy to understand were to go and what to do. We boarded the train and then rode up inside it and parked up. Shortly after parking up the train set off and within no time we were in France and ready to disembark. Due to it being a 300+ mile day (and also the fact that we had lost 1 hour due to the time difference) we made the decision to take the motorway for the first 80 miles of the day. We left the motorway at Cambrai and headed on the D960 for Guise. The roads in France were dry and the weather, although cloudy, looked like it would be fine for the day. We passed through Guise and continued on to Vervins, where we joined the D966 to Montcornet. 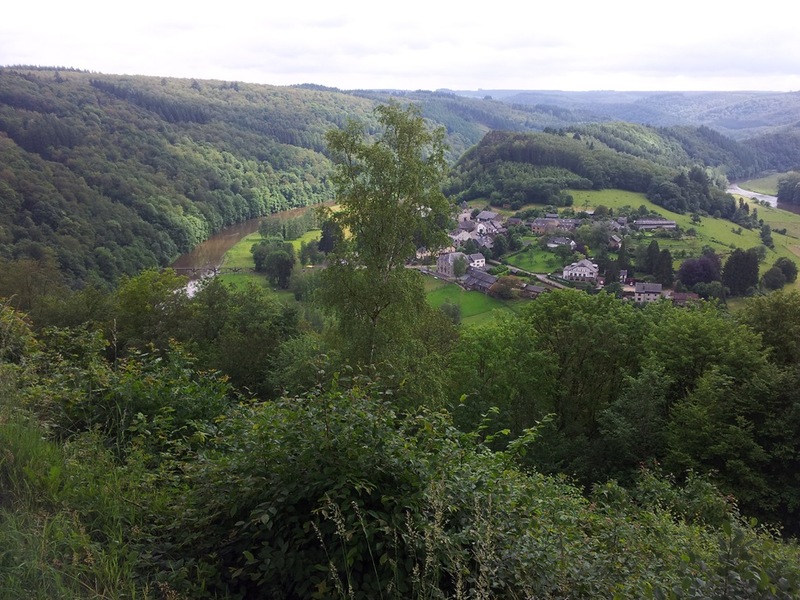 We were now in the Ardennes and started to head for the Belgian border. After Renwez we joined the D988 and started to head into the Ardennes Forest. We then joined the D31 which was our first real twisty road of the holiday. It was really peaceful and tranquil as we rode along the tree lined roads. 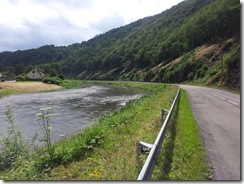 We also stared to criss cross the Semois River as the road and river ran along an almost parallel course. We stopped just outside Les Hautes-Rivieres for lunch. 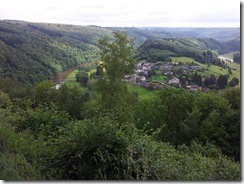 We then crossed over into Belgium and continued through the Ardennes for a little while more. The twisties pretty much ended as we turned South onto the N89 and headed back towards the French border. We flirted with the border for many miles more until we finally crossed back into France on the D29 near to Tellancourt. 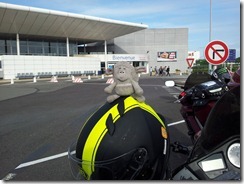 We then joined the main N52/A30 motorway to Metz. 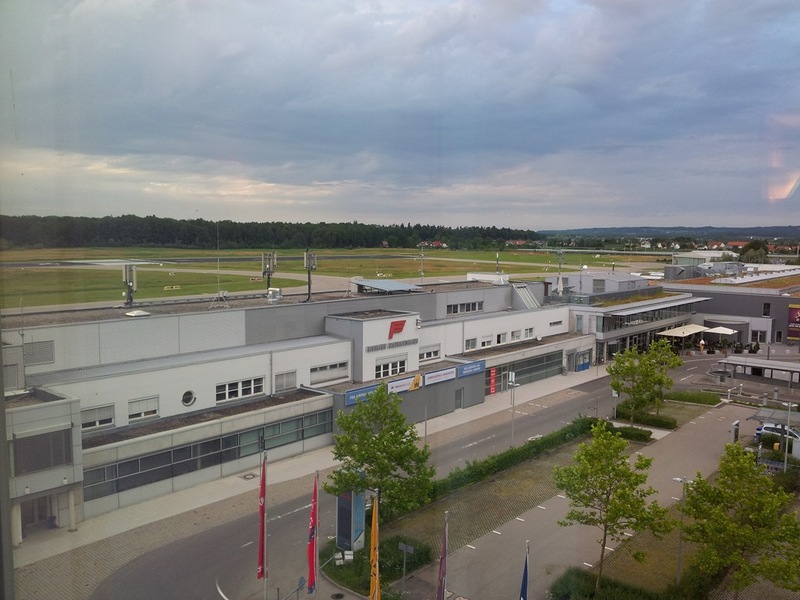 After a very long and tiring ride we eventually arrived at our hotel for the night the Etap Hotel Metz Technopole. After a quick shower we headed over to the Courtepaille for a much needed evening meal. We awoke this morning to a lovely blue sky and it was also pretty warm. We had a pretty short ride today compared to the previous day so we didn’t get up as early. We had breakfast and then headed out. We left Metz on the slightly congested N3 and headed for Sarralbe. Here we joined the D38 and started to come across less and less traffic. 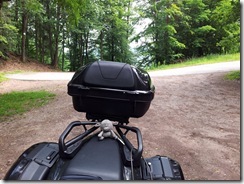 We soon arrived on the outskirts of the Northern Vosges Regional Natural Park. Again we were able to ride along some nice tree lined roads. We arrived on the outskirts of Bitche and La Citadelle de Bitche came into view as it towered above the town. We left Bitche on the D35 and soon passed by a very large army training base. We continued on the D35 and then turned off onto the twisty D190 and encounter our first switchback of the tour so far. 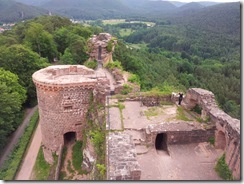 We then stopped and parked up at the carpark for the ruins of Château du Wasigenstein. We were able to leave our helmets and jackets with the bike as we now have the super Pacsafe Stuffsafe 80. After a brief mistake with the signage we eventually found our way to the castle. I manage to clamber to the top of a steep stone staircase and was greeted with a breathtaking vista. 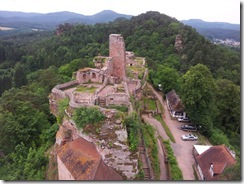 We left Château du Wasigenstein and headed further along the D3 to Château du Fleckenstein. Due to the state of the road up to the carpark, we decided not to stop and have a look around and instead moved on to our next castle stop. 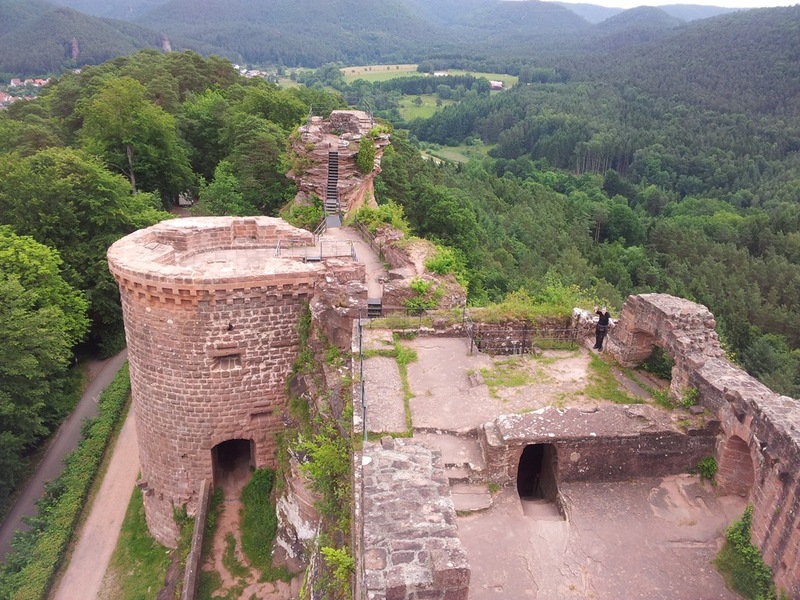 We crossed over into Germany and headed North to Altdahn Castle. We parked up and headed up the hill to the castle. It was a lovely castle situated on top of a rocky outcrop, with amazing views in all directions. After a tiring walk around the castle and going up and down many high stairs and even ladders (they would never let you do that in the UK! ), we sat down at the cafe for some much needed coffee and cake. While I had been walking around the castle Helen had been getting to grips with the black castle cat. We left Altdahn Castle and headed for Baden-Baden. We crossed back into France and then just before we crossed back into Germany the satnav decided to have a complete fit. It went into the vicious crash and re-boot cycle and wouldn’t come out of it. I eventually managed to get it back up and running with a little help from the laptop and McDonalds free WiFi. If we hadn’t had the laptop I don’t think we would have got the satnav back working again. We then crossed over into Germany again and soon arrived on the outskirts of Baden-Baden. Unfortunately the main tunnel bypass was closed so the satnav had to pick us a way through. It was very slow going at times and seemed to take forever. But we eventually left Baden-Baden and joined the infamous B500. The first part of this road is very twisty indeed. So much so that I came across a car that had failed to take one of the corners and had ended up on the wrong side of the road. I had to brake quite hard to let him back onto the right side of the road. We followed the B500 for a while before turning right onto the L87 and dropping down into the valley to Seebach. 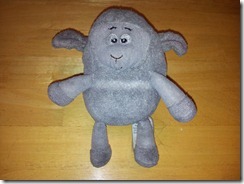 We soon arrived at our hotel for the night Pension Williams. It was full of bikers already, most of which where from Yorkshire. The owners got pizza in for everyone as the England v Ukraine game was on. We also made use of the self-service bar. During the first half the heavens opened and we temporarily lost the satellite signal. We awoke to low cloud, rain and very wet roads. 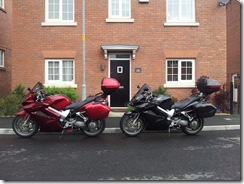 Thankfully we managed to pack the bikes up in between the heaviest of the showers. We left Seebach with light rain showers and headed back up to the B500 on the L87. We continued on the B500 for a while and through several patches of low lying cloud and then probably after an hour we suddenly hit dry roads and no rain. The roads were now completely dry and the sky didn’t look like it was going to rain again anytime soon. 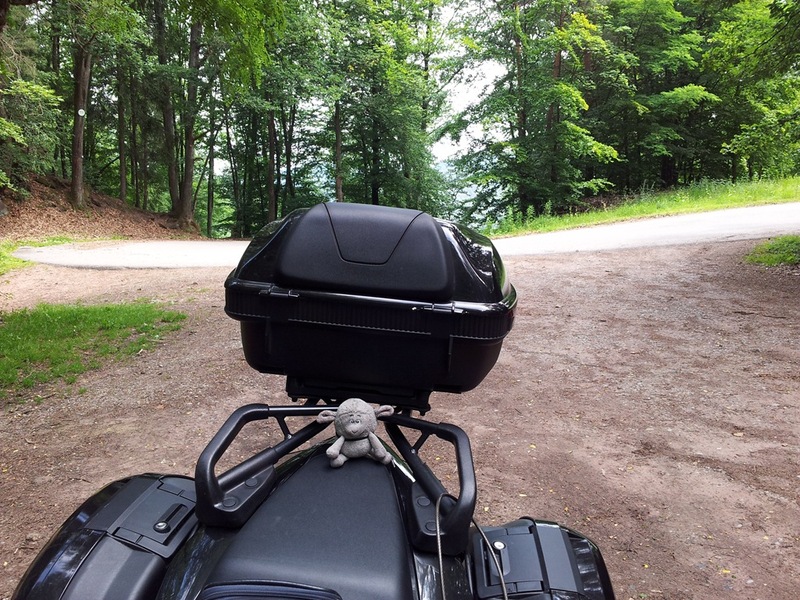 We followed the B500 for its full length South and eventually ended up in Hinterzarten. The B500 is a pretty nice road most of the time, however some parts of it were very busy and hard going. We then joined the B315 and headed East towards Weizen. At this point we came very close to crossing into Switzerland and flirted with the border for the majority of the rest of the day. We then continued East on the B314 towards Hilzingen. At this point we joined the A98 and our first ever Autobahn. 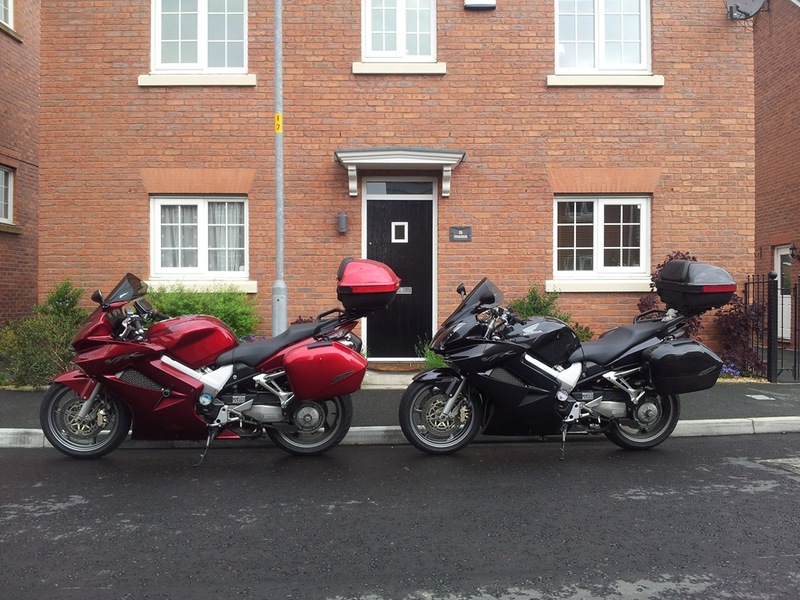 The satnav reported no speed limit so we opened up the bikes to make use of this fact. After a while we eventually arrived on the outskirts of Uberlingen and got our first glimpse of the giant Lake Constance. Just after this point we hit problems, the main road into Friedrichshafen was closed for 4 weeks. So every other road was very congested, we managed to avoid most of it by the satnav re-routing us but we did get stuck in some real bad traffic for about 10 minutes. Due to the size of the road and the large amount of lorries about it was impossible to really do any filtering past it. Then with about 3km to run to the hotel the heavens opened and we started to get pelted with golf ball sized rain drops. Thankfully we had the Gore-Tex stuff on otherwise we would have been absolutely soaked. 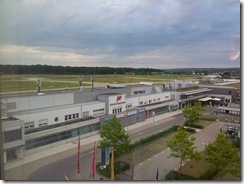 We then arrived at our hotel for the night the ibis Friedrichshafen Airport Messe hotel. We later went down to the bar for a coffee and the weather had brightened up again and the roads had completely dried up. Nice meal at the hotel restaurant with some wine then much needed sleep. It was dry and sunny again today when we woke up. We packed up and set out for Garmisch-Partenkirchen on the E54. 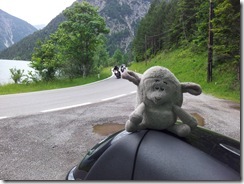 We then crossed over the A96 and followed the B308 through Scheidegg towards Fussen. The B308 is a nice flowing road with the occasional set of hairpin bends thrown in for good measure. Near to Rothenbach we joined the ST2001 which was another nice road, we followed that to Sibratshofen where we joined the B12. We then followed several faster roads including another Autobahn high speed blast. We then joined the E532 towards Fussen and turned off part way there to visit Falkenstein Castle. Unfortunately it was up a very steep private road and the carpark was 1.7km away. So we decided that it was far too hot to walk all the way there in our bike gear. 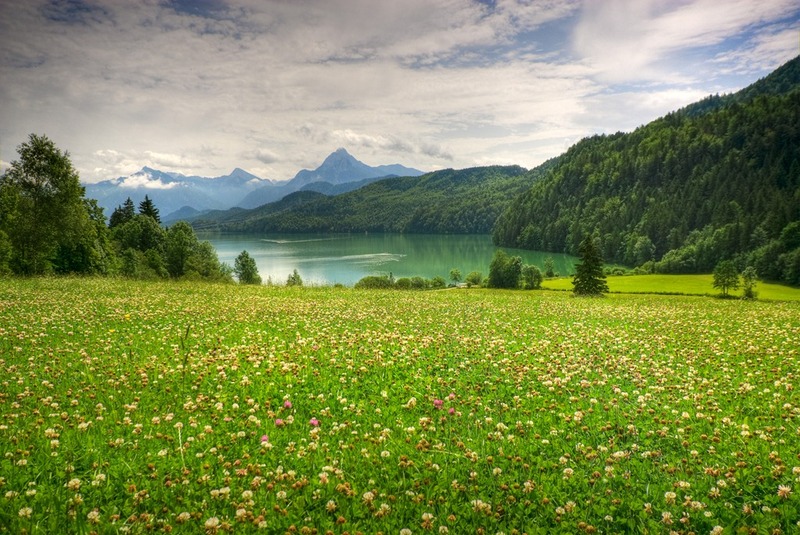 We left and headed for Fussen and stopped by Weißensee (lake) for some lunch. We left here and soon arrived in Fussen and then followed the ST2008 to Hohenschwangau. We intended to stop and take some photos of Schloss Neuschwanstein but it was completely covered in scaffolding and sheeting from this side. As it was also heaving with tourists (mostly walking out into the road in front of us!) we decided not to stop and headed back to Fussen after a brief look at Schloss Hohenschwangau. 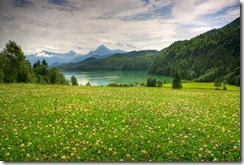 We stopped outside of Fussen for fuel and then headed on the L396 for Austria. We soon passed over the border into Austria and then after a while turned onto the B179. 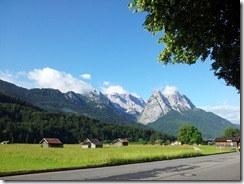 We followed that for a while until we turned back East and headed for Garmisch-Partenkirchen on the L255/ST2060. This was a stunning road that initially twisted its way alongside Plansee (Lake) before running parallel with the river for much of its length. We intended to call in at Schloss Linderhof for a quick look without going inside, but they were charging 1.50 euros per bike just to park! So we did a quick u-turn and headed for Garmisch- Partenkirchen as it was getting hotter. We arrived at just after 2:00pm and checked into our hotel for the night at the Mercure Hotel Garmisch-Partenkirchen. A couple of hours after we arrived the weather closed in and it started to rain and thunder. Unfortunately for us this hotel didn’t have aircon so we had to have the windows open all night. This meant we didn’t have a very good sleep as it was a very noisy place and the smokers gathered at the front of the hotel under our window which meant we got the smell in the room. It also didn’t help when all the happy Portuguese football fans in about 50 cars came around town beeping their horns and shouting at 1am. Although it rained hard overnight the roads were drying and the sun was out when we awoke. We left Garmisch-Partenkirchen on the B23/B187 and headed for Austria again. We were soon on nice dry roads and were loving the quiet early morning roads. We knew today would be a hard slog as it was around 320miles on mainly mountain roads. We weren’t wrong, as we were riding for almost 12 hours including the brief break stops that we had along the way. After some more nice roads we eventually reached the start of our first proper pass of the tour. 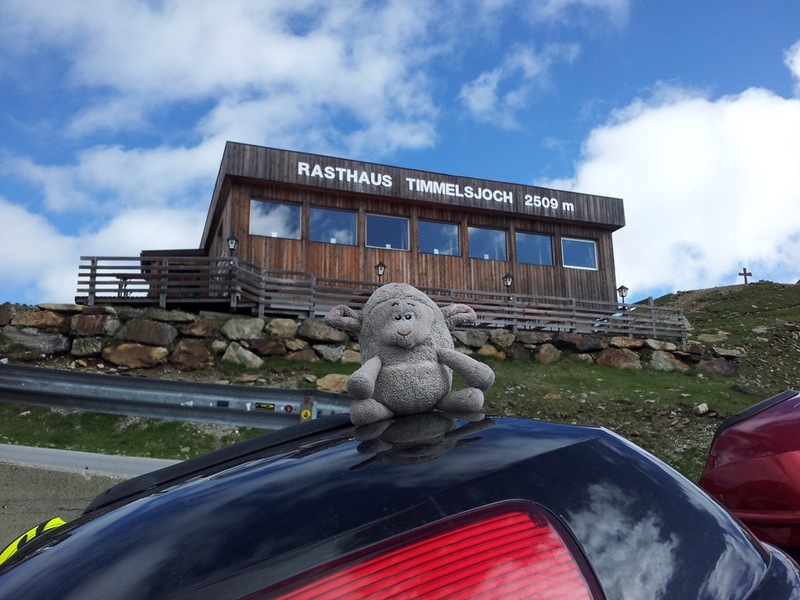 The 2509m Timmelsjoch Pass otherwise know as the B186. This is actually a toll road and costs 12 euros for a motorcycle to cross in one direction (return is 14 euros). Although you could climb to the top from the Italian side and as long as you went back the same way you could get to the top without paying the toll. Anyway in my opinion as a one off it was worth every cent of the 12 euros as it was a nice flowing road with a lovely surface and nice wide hairpins. After a while we arrived at the top and stopped for a brief break and to take some photos at the telescope. After the brief break we started the descent on the Italian side, which was just as good as the ascent. 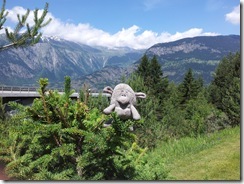 We soon arrived in Merano and here is where the fun started – not! 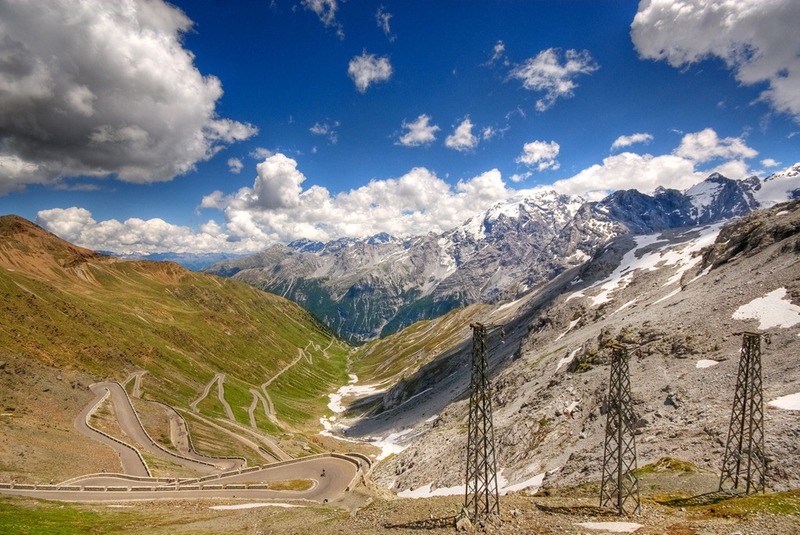 - on the roads to the bottom of our next pass, the legendary Stelvio Pass. It was a stop-start affair as we went from village to village in almost constant 50km speed limit zones. It didn’t help that loads of old tractors were about (obviously going to some convention) causing absolute traffic chaos. The temps were in the 30’s by now and the bikes were constantly running at over 100 degrees. The bikes got so hot that Helen’s radio stopped working all together. 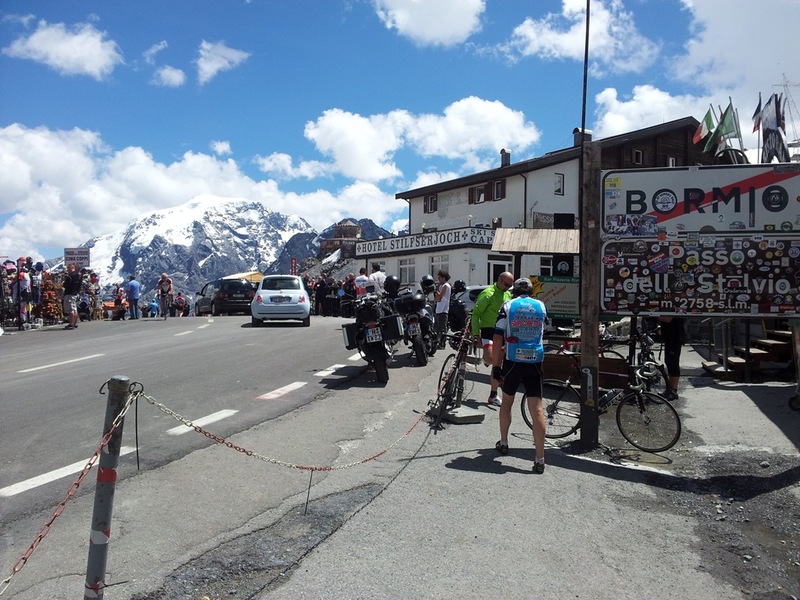 After this hell we eventually turned off the main roads and started the climb to the top of Stelvio Pass at 2757m. 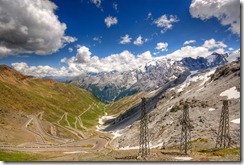 Just before we left for this tour I had seen the Giro d'Italia climb up Stelvio Pass and it didn’t look that bad. Well, unknown to me, they climbed up the easier 16 hairpin Southern side of the pass, we on the other hand climbed up the much harder 48 hairpin Northern side! To say that Helen was not impressed would be an understatement. Thankfully the radios cut back in before we got to the real bad hairpins at the top. This enabled me to tell her that the hairpin was clear so that she could just concentrate on getting the bike turned. Eventually to both of our relief we reached the summit. Yes the views were amazing but neither of us would ever do it again. Box ticked, job done. After a lengthy stop to calm our nerves with a couple of diet cokes, we descended down the Southern side of the pass and down into Bormio. We slightly detoured here as we needed fuel fairly soon and I didn’t think we would find any over the next pass, I was wrong. 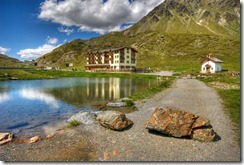 We left Bormio and headed for Livigno and the Foscagno Pass at 2291m. We found this pass to be much easier and enjoyed the climb up to near the summit where we stopped by a beautiful small lake for a much needed lunch break. Little did we know that Livigno enjoys a duty free tax status and just over the summit we would pass through a customs checkpoint and then find loads of petrol stations selling dirt cheap fuel. 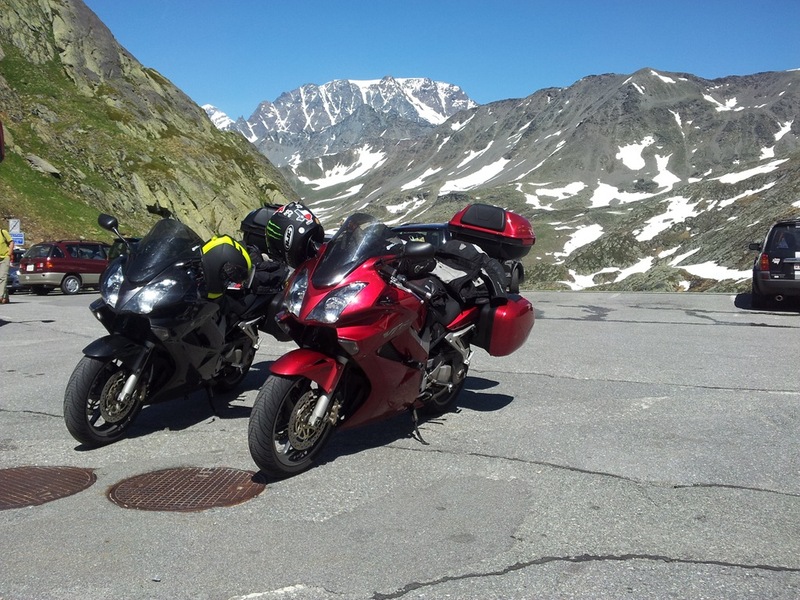 We passed over the summit and through the checkpoints and then climbed a little higher as we went over the Livigno Pass at 2315m and into Switzerland. 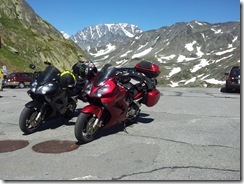 We then turned Northwest and headed over the Bernina Pass at 2328m and down into St. Moritz. 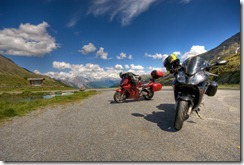 We then headed Southwest on the S37 towards Chiavenna in Italy via the Maloja Pass at 1815m. This was a nice twisty descent but Helen wasn’t that keen after the traumas of Stelvio! 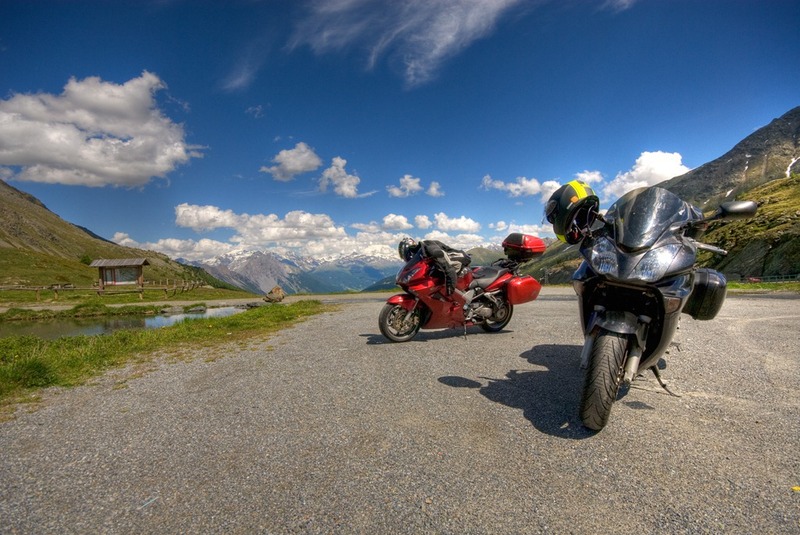 We then headed South from Chiavenna on the S36 towards Lake Como. We soon arrived at the top of Lake Como but I was slightly confused why the satnav said is was going to take us so long to do the final 70km. Little did we know that the whole distance along Lake Como was virtually covered by a 50km speed limit. It was sheer hell, very hot with lots of traffic and truly awful driving standards (suicidal bikers and red light jumpers). I am pretty sure for most of the final 70km the bikes didn’t get much below 100 degrees. Finally 12 hours after we left Garmisch-Partenkirchen we arrived at our hotel for the night the Hotel Ibis Como. After a good sleep due to us being knackered and cool all night with the much needed aircon, we awoke to a lovely blue sky and sunshine. We set out early again as we had another long day ahead of us and several high passes to do. 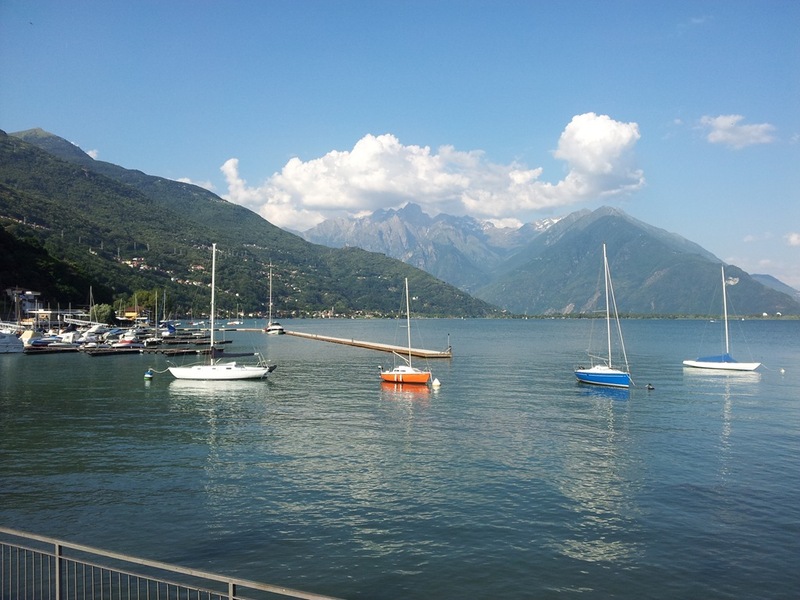 We left Como and headed over towards Luino on Lake Maggiore. On our way there we could see a huge low black cloud and knew that it must be raining up ahead. We weren’t wrong, as just before we crossed back into Switzerland we hit a huge deluge of rain that actually stung as it hit our arms. Thankfully the Gore-Tex textiles did their job and kept us pretty dry. I also have to say that the new Michelin Road Pilot 3 tyres that we had put on before the holiday, performed brilliantly in these awful conditions. We crossed over into Switzerland and just got the usual nod from customs to go through. We stopped just inside the border under cover to get out of the rain a bit and then realised that the rain was moving with us. By the time we were ready to move on the worst weather had moved off North. 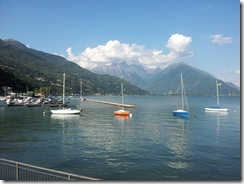 We continued on to Locarno and then turned back on ourselves to head West back towards Italy again. We joined the S337 and headed for Domodossola in Italy. This road was quite a nice and twisty affair but was hard work, especially as the weather was now dry and very warm again. 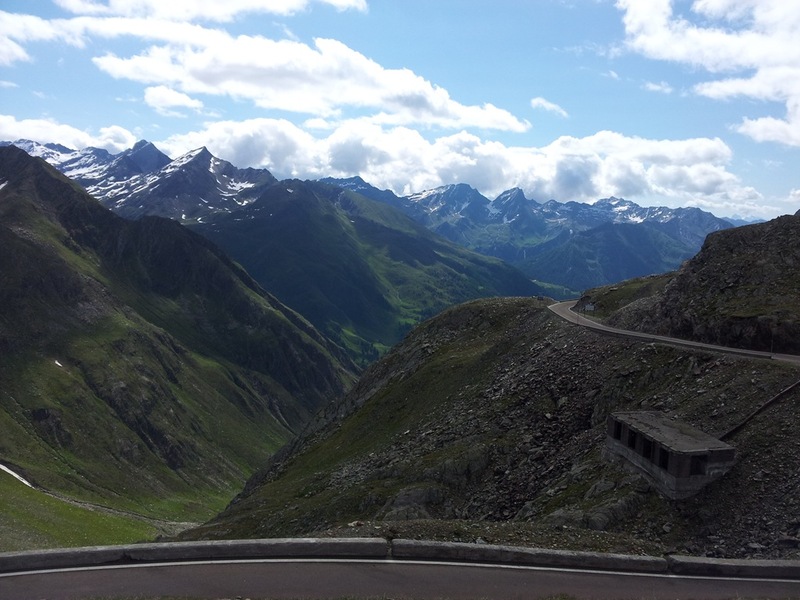 We crossed over into Italy and then headed Northwest on the S33 for Simplon Pass. At this point the satnav crashed again for the second time this holiday, but this time I couldn’t recover it. We had to resort to maps and hand written instructions. 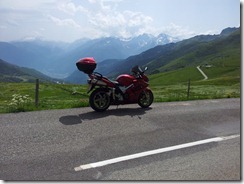 We climbed up and over the Simplon Pass at 2005m and back into Switzerland. 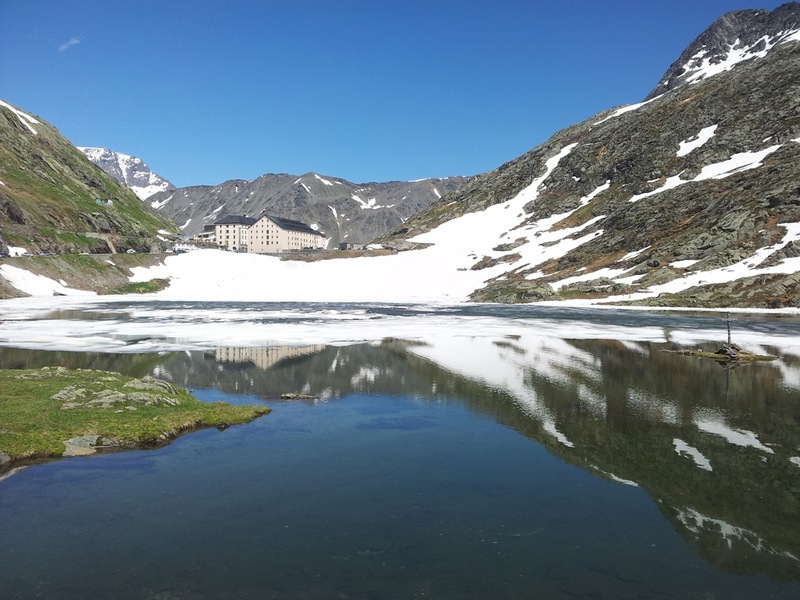 We stopped on the descent for a break at a rest area and couldn’t believe the quality of the toilet facilities on offer – complete with black and white marble flooring! After our brief butty stop, and much admiration of the bikes by a random German that Helen managed to converse with, we headed down into Brig and then towards Sion. Due to us not being able to use the motorway, as we weren’t paying 33 euros each for vignette, it took us a while to get there. We stopped briefly at a garage to fill up with fuel and bought some water to drink sitting at a table under the garage’s parasols – great Swiss facilities again! 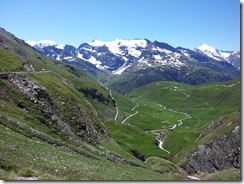 We then headed for Martigny and the start of the Col du Grand St.Bernard. 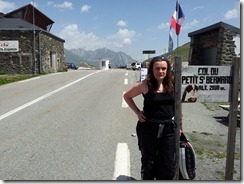 We started up the Col and soon entered the tunnel and then turned off to start the climb for the top of the Col. It was a fairly nice wide road but still had a few sharp hairpins thrown in for good measure. We arrived at the top for a water break and to take some stunning photos. 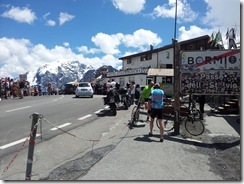 We left and passed over the top of the Col at 2469m and then through customs back into Italy again. We stopped briefly by the lake on the Southern side to take some more photos and then made a start on the descent. For me this was the best descent so far and I was able to really attack it with the use of some serious back brake action to keep the bike under control. One word of caution though some of the fast corners had no edge protection at all, get it wrong and you are off the edge (enough said). 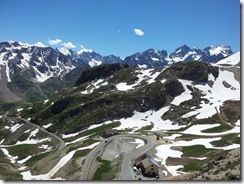 We eventually arrived in Aosta and turned West and headed for Courmayeur on the S26. As we got nearer to Courmayeur the impressive Mont Blanc came into view. 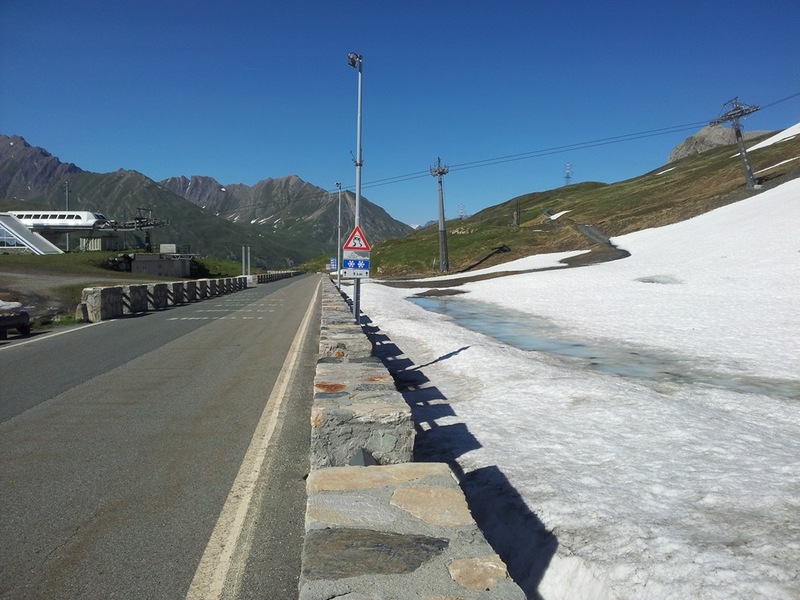 Then at Morgex we turned onto the start of our final climb of the day the Col du Petit St.Bernard. By now we were well used to tight hairpins so this climb, although tiring, was not that difficult. It took us a while to get up to the top as the climb is over 20km in distance to the summit at 2188m. We stopped at the top to take some photos and have a drink as it was still very hot. We set off again and started the descent down to Bourg-Saint-Maurice. It was a nice descent, although the road has started to crack and break up in some places. Again it took a while to get down as the descent was over 20km long. We eventually arrived in Seez and turned left and headed up to our chalet for the next week near to Villaroger at Skivillaroger. The narrow forest road was fine for the bikes, but the final right hairpin turn up to the village took some concentration in our tired state! The chalet is in a tiny hamlet of traditional French Alpine buildings tucked behind a very impressive looking balconied chalet that looks out onto the steep valley. There are also some great views from our bedroom of the valley and little village and church opposite in the distance. A quick unpack then dash to the Super U for a mini food shop. Cold beer and wine left in the fridge by our hosts Jonny & Kumari was a very welcome treat on our return! Too tired and too late for the hot tub, but there’s time yet. Due to our recent long days in the saddle we decided it would be best to have a rest today. 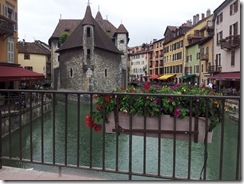 So we went down to the Intermache in Bourg-Saint-Maurice to do the rest of our shopping. Due to it being Sunday the Super U was closed so we had to do our shopping in the Intermache instead. We much preferred the Super U so we will be doing the rest of our shopping there. best to just use our current route to get to the chalet. Although it was fairly hot this morning it was very cloudy at low level and raining. We stayed in till early afternoon and decided to head over to Albertville on the main roads as a reccy for when we head off back home. Surprisingly the roads were dry and the weather towards Albertville looked clear and sunny. 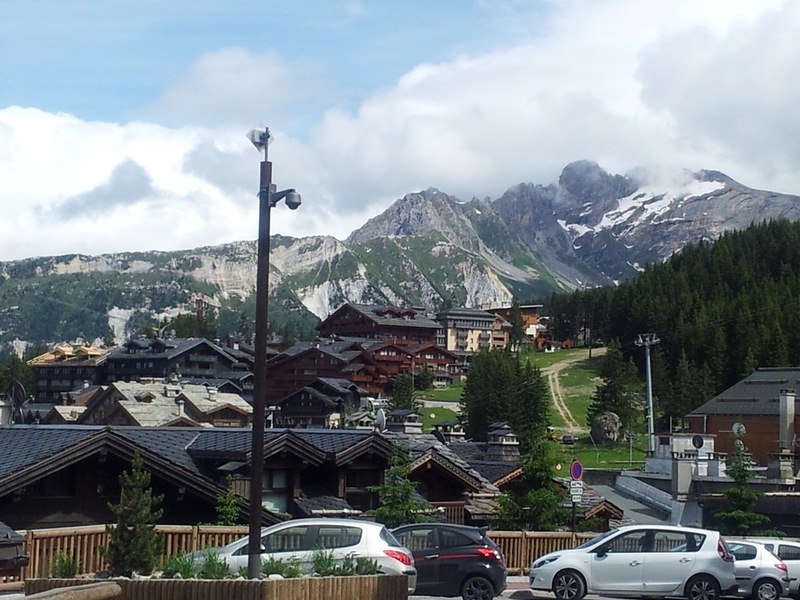 We stopped in Albertville for lunch and then decided to head back and see if Courchevel was clear. As we neared Moutiers the roads up to Courchevel looked to have cleared so we decided to go up and have a nosey. 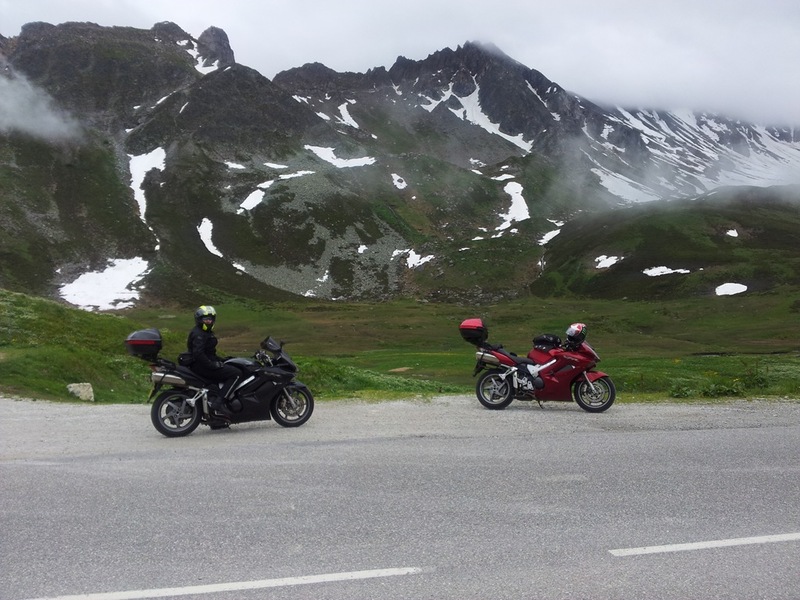 We joined the D914 and climbed up to Courchevel 1850. There was a lot of road work, grass cutting and general building work going on. Obviously they need to get it all done in the short period between ski seasons. To our surprise we found La Chabichou hotel restaurant/bar open, so we headed in to see if we could get a coffee. 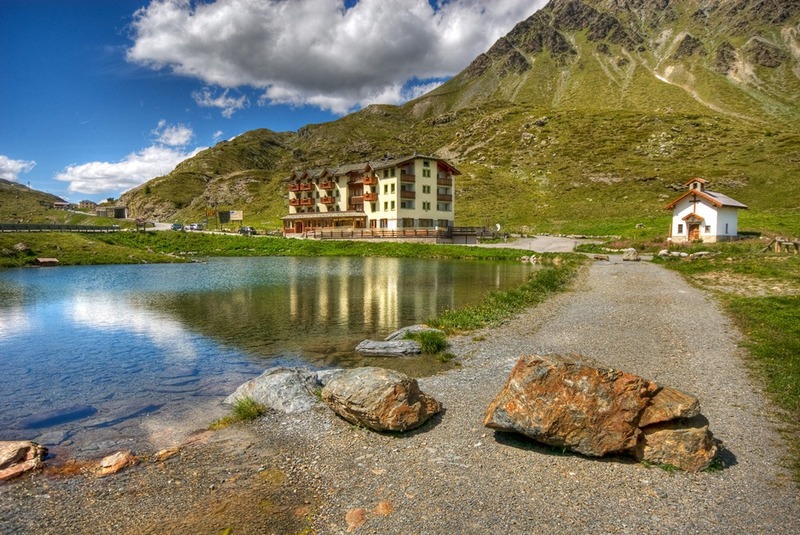 It turns out that it is one of the high profile hotels in Courchevel, demanding 950 euros per night in high season for a minimum stay of 6 nights! So no surprise that our bill for 2 coffees was 8 euros. We made up for that with the free sweet treats on offer – 3 glasses filled with mini cookies, meringues and marshmallows. After our coffees we headed back via the Super U for fuel and some bread for tomorrow. It was a bit gloomy and cloudy again this morning but the weather over towards Annecy looked promising. We headed out just before lunch as the low cloud was starting to clear. 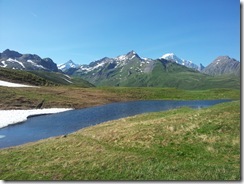 We headed into Bourg-Saint-Maurice and then turned right onto the D925 and headed towards Beaufort. 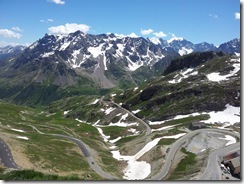 We soon started the climb of the Cormet de Roselend but before going over the top we turned off on a road Jonny had recommended, that had great views of the glaciers. Unfortunately we weren’t supposed to go up during the day and were promptly told off by the forgiving local police. 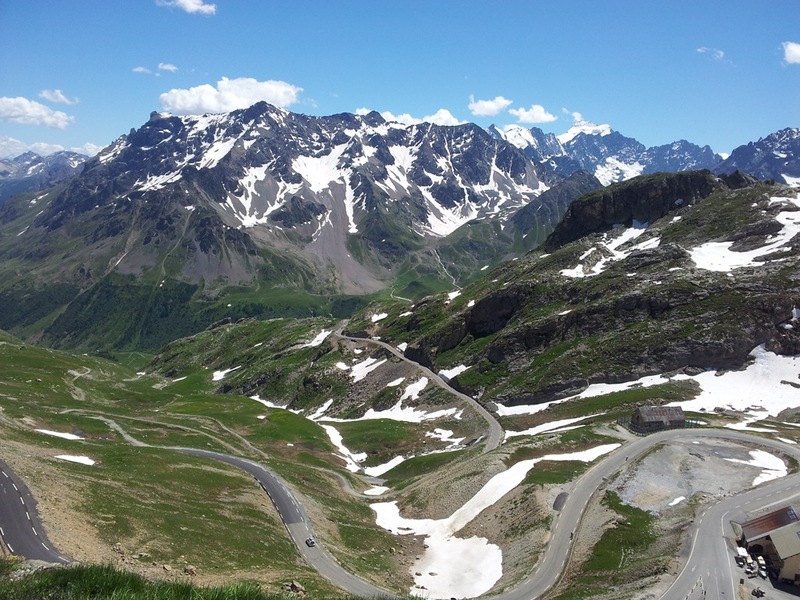 We did a u-turn and headed for the top of the Cormet de Roselend at 1967m. We only stopped at the top briefly as the cloud started to move in and it also started to drizzle a bit. 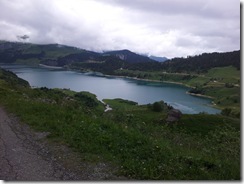 We set off for Beaufort (fantastic cheese made there that we’d bought earlier in the week from Super U) and stopped briefly above Lac de Roselend to take some photos. We set off again and soon passed through Beaufort on our way down to Albertville. At Albertville we turned right onto the D1212 and headed for Annecy. 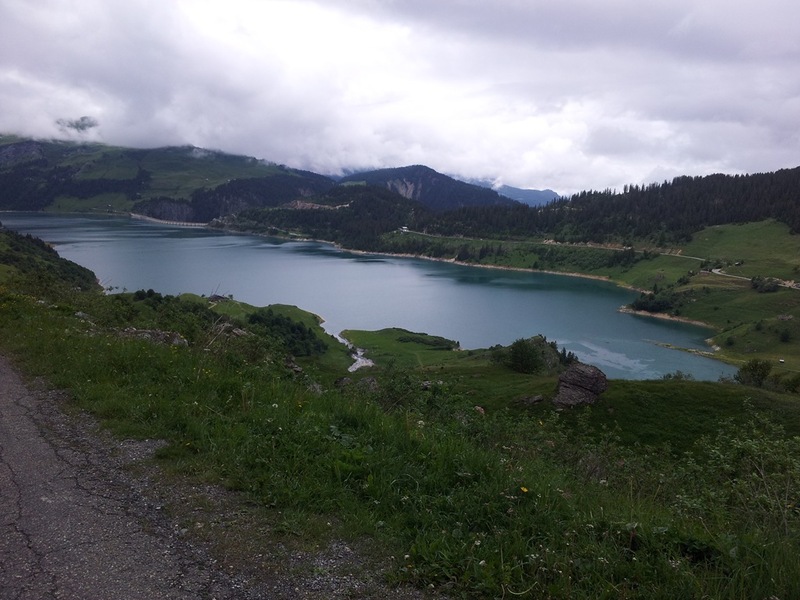 We had intended to go over the Col de la Forclaz that Johnny had recommended as having stunning views of Lake Annecy, but just our luck there were more roadworks and the road was closed 6km ahead. So we had to give it a miss and instead headed along the D904A and stopped by Lake Annecy for lunch. After lunch we followed the Lake and headed into Annecy itself. We managed to accidently find some motorcycle parking right by where we wanted to stop. 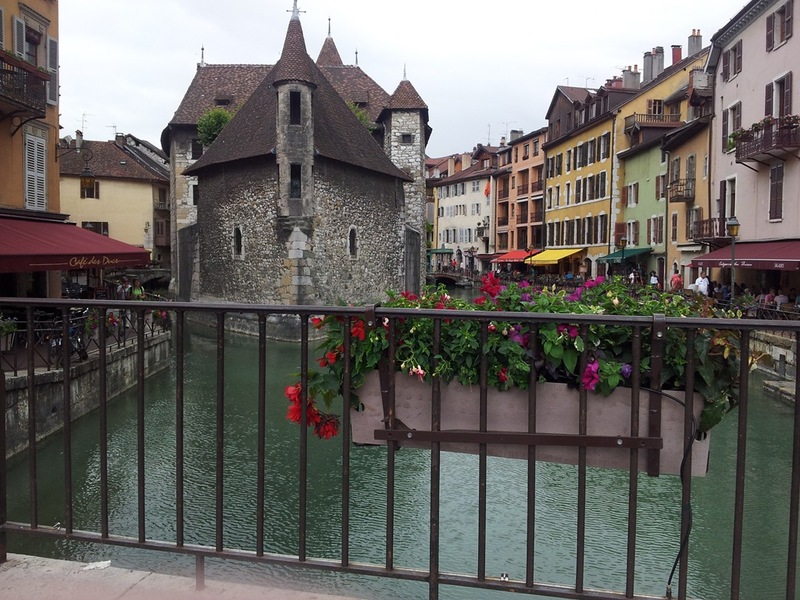 So we parked up and had a little walk around the old town of Annecy before heading back the way we came. We then stopped near to Menthon Saint-Bernard Chateau in the town of the same name for coffee and coke. We left here and then followed the main roads back to Bourg-Saint-Maurice via Albertville and Moutiers. The weather today has been mainly dry and very hot, but we did have the occasionally sprinkle of rain thrown in. It was very hot and already sunny when we woke up this morning. The sky was a lovely shade of blue and without a cloud in sight. So we decided today was the day to tackle the Col de L’Iseran and the Col du Galibier in a 218 mile loop. We left the chalet and headed Southeast away from Bourg-Saint-Maurice for a change on the D902. We soon started the climb up the Col de L’Iseran and hit roadworks near to Barrage de Tignes. Loose gravel road resurfacing and line painting was going on all the way to Val-d'Isère. 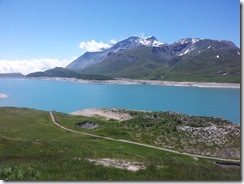 We eventually passed trough Val-d'Isère, no more roadworks and freedom to attack the climb of the Col. It was a really nice ascent with a wide variety of different corners on a pretty decent surface. It took a while to get to the summit but we eventually arrived to some breathtaking views. 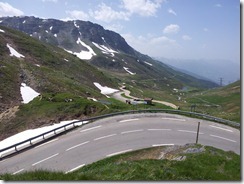 The summit of the Col at 2770m is the highest paved mountain pass in the Alps. Due to the height, it was reasonable cool at the top and testament to that was the skiing that was still going on. 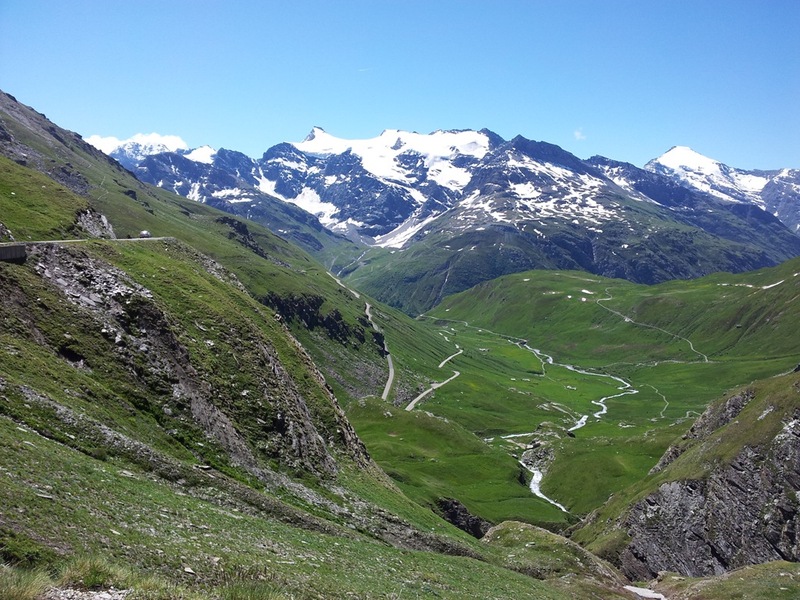 After a while and many photos we started the descent and headed down to Bonneval-sur-Arc. At this point the road pretty much levelled out and ran along the valley bottom towards Lanslebourg-Mont-Cenis. This was a pretty quick stretch so we arrived in no time at the bottom of our second climb of the day. We turned onto the D1006 and started the twisty climb up to the Col du Mont Cenis. 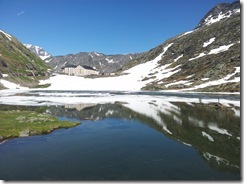 We crested the summit at 2083m and continued on down the other side and stopped by Lac du Mont Cenis for lunch. 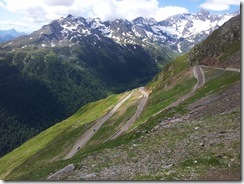 After lunch we continued the descent and followed the road into Italy and down into Susa. 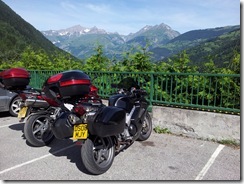 We then joined the S24 and headed for Briancon in France via Oulx. I knew we couldn’t get all the way round to day on 1 tank so we started to look for somewhere to top of the tanks. For some reason the Italian self service 24hour petrol stations wouldn’t accept any of our credit cards. 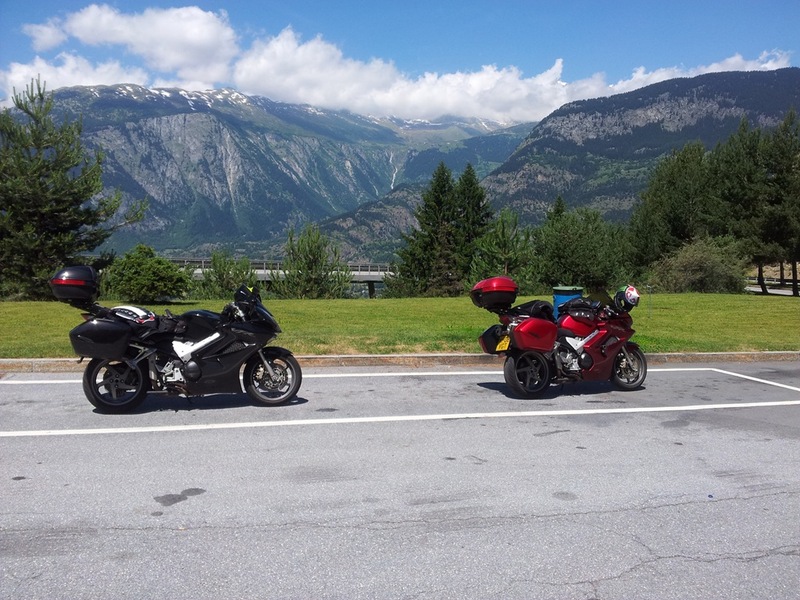 We eventually arrived in Briancon where we found a petrol station willing to accept our business. 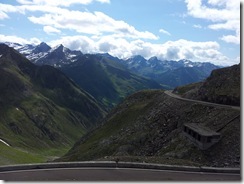 We continued on the D1091 and headed up our third climb of the day the Col du Lautaret. This was a very easy climb indeed and we soon reached the summit at 2058m. At the summit we turned right onto the D902 and then started the ascent of our next climb of the day the Col du Galibier. This climb was more challenging, but a lot of fun and again great views. 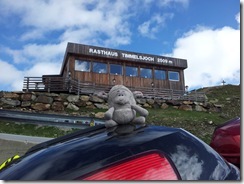 At the very top you can go through the tunnel or take the final set of tight hairpins to the top at 2646m. We soon arrived at the top and stopped in the makeshift carpark for a rest. Due to this final bit only being added in 2002 there are no buildings at the top of any note. 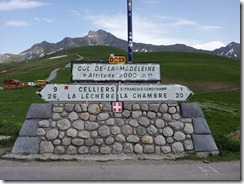 We left the top and descended down into Valloire and then onto the Col du Télégraphe at 1565m. From here it got decidedly less fun as we came across more roadworks. Road resurfacing with gravel again, but this time around hairpins oh what fun. 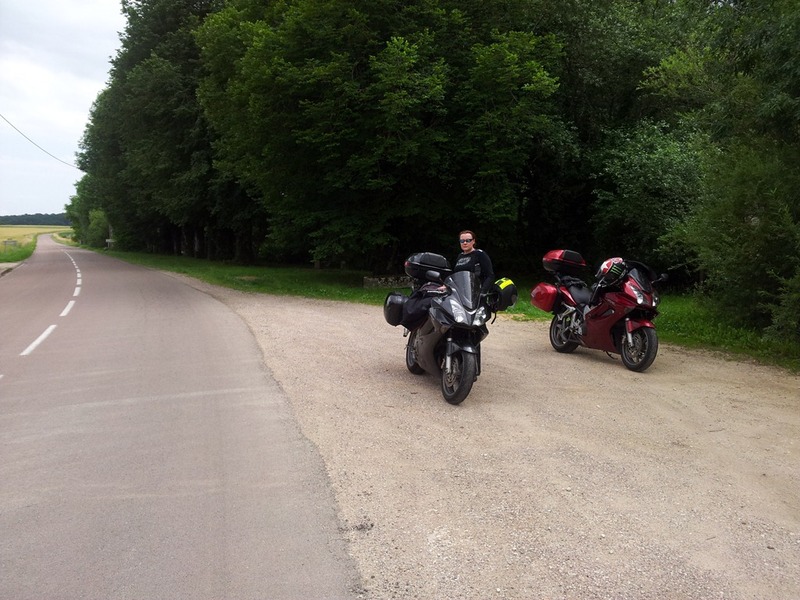 Eventually the gravel ended and we arrived in St-Martin-d’Arc. 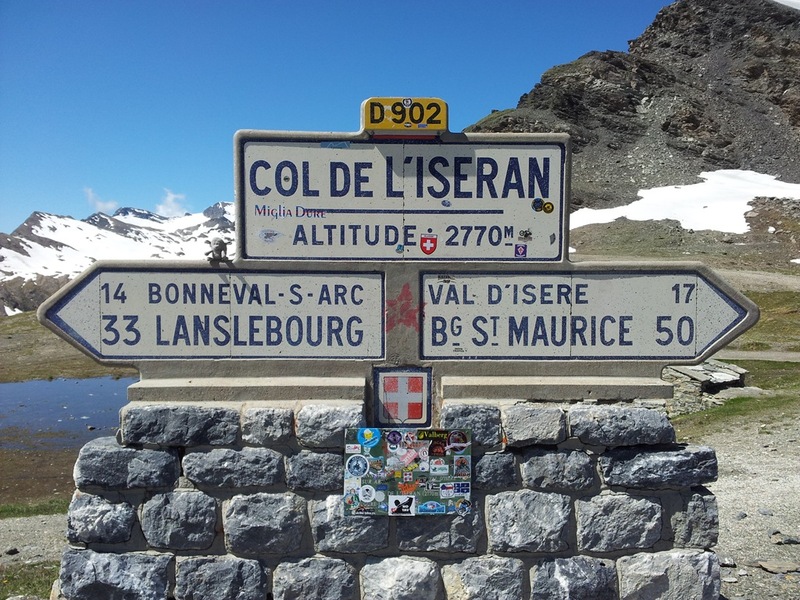 Here we joined the D1006 and headed back towards the Col de L’Iseran. 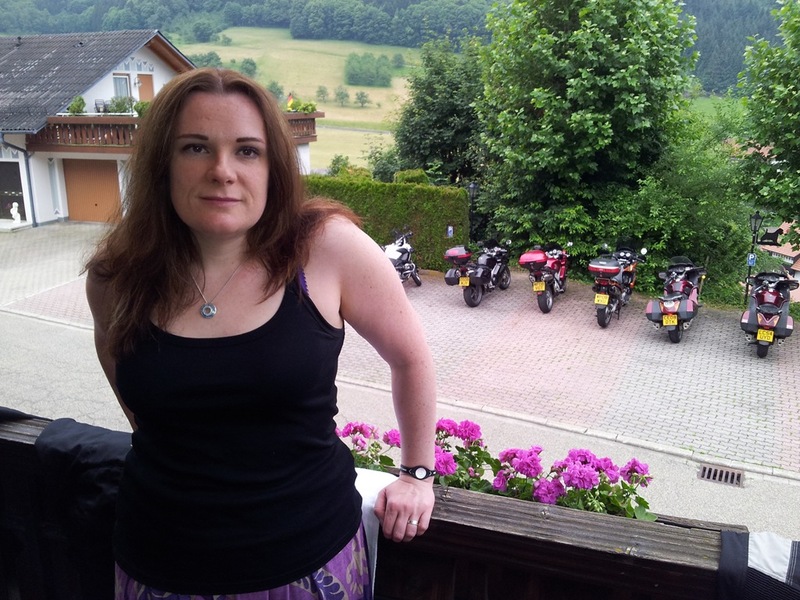 We stopped briefly at an Intermache to get some ice-creams and had a brief chat with some German bikers. 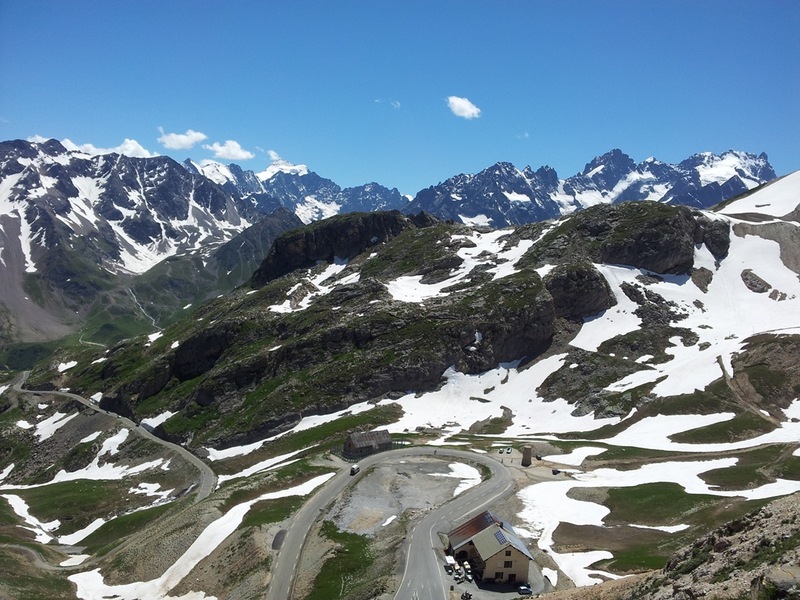 We left here and headed over the Col de L’Iseran for the second time today. Much cooler on than top this time, which was much needed and very refreshing. We didn’t stop long and came across the guys painting the white lines near the top. The wet paint was very slippery, if you got your wheels on it. We arrived back at the chalet after a tiring but very eventful day. It was another beautiful, sunny and hot day today (Low to Mid 30’s by the afternoon). So we decided to have a trip over to Chamonix to get on the train up to the ice cave. Before going we oiled the chains as they hadn’t been done in a few days and Helen found a suspect item in my back tyre. Further investigation it appeared to be a nail and was well embedded in the tyre. No air was leaking out but we decided it was best to get it checked out before attempting to pull it out. We used the internet and found that there was a Roady shop down in Bourg-Saint-Maurice that should b e able to do it. We first went to the car shop and by the time we had gone to the right place it was too late to fix it before they closed for lunch. We went back after lunch for 2:00pm so that they could repair the tyre. The mechanic seemed to know what he was doing and repaired the tyre very well. There however was some confusion over what pressure I wanted the tyre at. I knew it needed to be 42psi but obviously that is an imperial measurement. We eventually came to a figure and he pumped the tyre up to that pressure. By this time it was nearly 3:00pm so we decided that Chamonix was out and we would have a quick run up the Col de la Madeleine. I initially was going to go up this Col tomorrow on my own as I though Helen wouldn’t like it. But after looking on Google Street View I though it would be alright for Helen as it looked quite wide near the top. 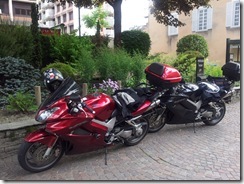 We headed for Moutiers on the main roads and then left the N90 at junction 36 and headed for the start of the climb. We joined the D94 and start the climb up to the top of the Col. It was apparent early on that the road at the bottom was tight and there was a lot of traffic about. Part way up Helen decided that she had had enough and stopped at a bar. I proceeded on only to find that she had already done the hard bit as the road now widened out and it was a fairly easy run up to the summit at 1993m. I took a few photos at the top and then came back down to meet Helen at the bar. We headed back to the chalet via the Super U for some more bread and fuel. I also used the free air machine to put some more air in as I had realised the gauges here are in Bar. I knew that 15psi was roughly 1 Bar so I put 3 Bar in the tyre so that when we got back to the chalet I could use my tyre pressure gauge to get the reading correct at 42psi. When we got back to the chalet I realised that I had left the dust cap back at the Super U, so I had to high tail it back to go and get it. Thankfully I was able to find it and apart from the wasted fuel no harm was done. Due to the heat we hadn’t had a great sleep last night and this morning it was even hotter. We decided with the long ride tomorrow and the current heat not to go to Chamonix today. 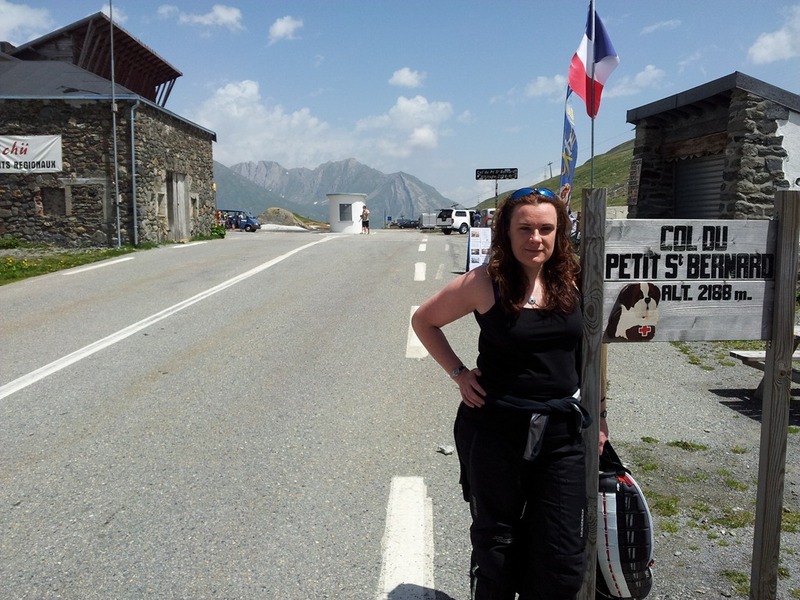 Instead we decided to go back up to the summit of Col du Petit Saint-Bernard for coffee and crepes at one of the cafes. We left and started the climb to the summit on the N90/SS26. It was a nice climb again and was much easier without the luggage on. We soon got to the top and took some nice photos as there was no cloud cover about, apart from the bit obscuring the top of Mont Blanc. We decided to go to the café on the French side for obvious reasons. I had a Strawberry Crepe and Helen had a Sugar and Lemon one. We left the top which was surprisingly warm considering the height we were at. I did check the air temp on the bike at some point today and it did say 43C when the bike was hot. 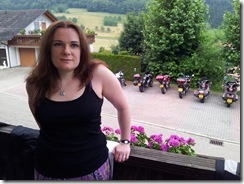 Later on when the bike had cooled down at the chalet it read a more accurate 33C. On the way down I stopped on the outside of one of the many hairpins to take some more photos and then we topped up with fuel at the Super U for the last time. We headed back to the chalet as it was getting really hot now and used the hot tub for the last time to cool down. Again it was warm and dry this morning and looked like it was going to be another hot one. We packed up the last of our gear and put the luggage back onto the bikes. 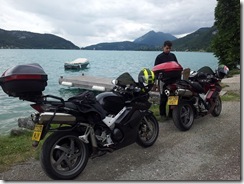 We headed off and followed the main roads to Annecy. Even at 9:00am in the morning Annecy was still hell and packed. We eventually got through after a little hold up and onto some better less congested roads. From Annecy we followed the D1508 for a while before turning off onto the more twisty D187 and D47 to Vulbens. We stopped in Vulbens for a brief rest before setting off again. From Vulbens we joined the D1206 and passed by Fort L’Ecluse on our way to Bellegarde. We then followed the D1084 to Saint-Germain-de-Joux where we joined the super twisty D55 to Oyonnax. This was a really nice road through a forest, but required a great deal of concentration. We then took the D13 to Thoirette and then turned North onto the D109. We now started to get back on to the barren and empty French roads in the countryside that we like. You can go for km after km without having to pass any cars at all. We called into the Super U at Arinthod for fuel and a brief rest. We left Arinthod and continued North on the D109 to Orgelet. We then joined the D52 and headed for Lons-le-Saunier. 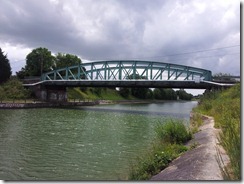 We skirted round the outside of Lons-le-Saunier and joined the D1083. We headed direct North up this road for a while not passing through any more villages and were able to make distance quickly. We turned onto the D475 and followed that all the way to Dole making good time again. We passed through Dole and continued North on the D475 again making good time. 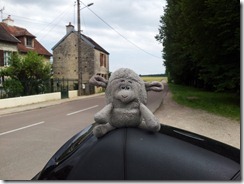 One of the few villages we passed through of any note was Gray were we crossed over La Saone. From here we joined the D67 and started to pass by nice looking picnic spots surrounded by trees. We stopped at one of these spots just West of Neuvelle-les-Champlitte for lunch. After lunch we continued on the D67 through Champlitte and headed towards the Champagne-Ardenne region. Just before Longeau-Percey the satnav crashed again and rebooted but again lost its past waypoint history. So we stopped at the Intermache in Longeau-Percey to consult a map and delete the already passed waypoints on the satnav. We were within our fuel window to get to Troyes from here so we filled up at the Intermache as we hadn’t passed by many petrol stations today. We left Longeau-Percey on the D428 on now turned Northwest towards Troyes. This was a nice flowing road and we were still able to make good time. We then joined the D13 at Maisey-le-Duc and continued Northwest. The roads were still flowing along nicely and we were still not seeing any traffic. 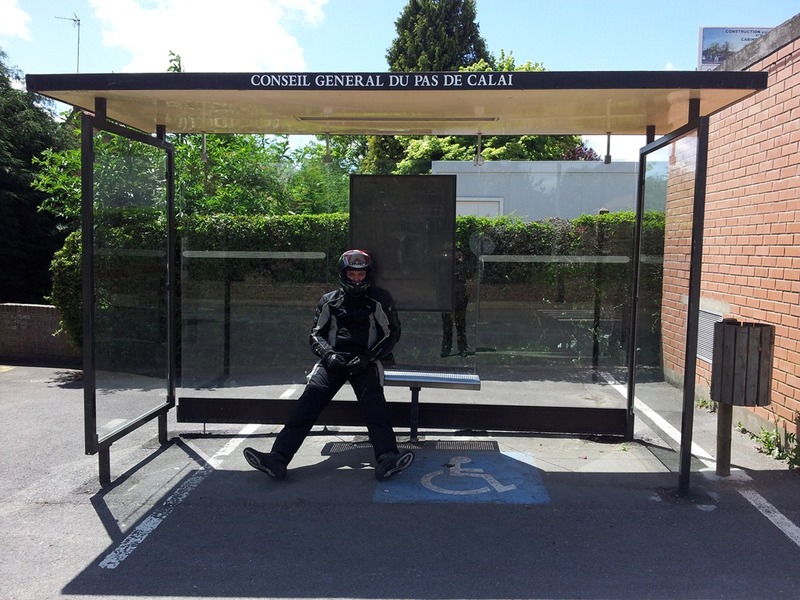 We stopped in Autricourt under some trees for a brief rest. Then continued on the D67 to Merrey-sur-Arce where we joined the D671 and headed for Troyes. 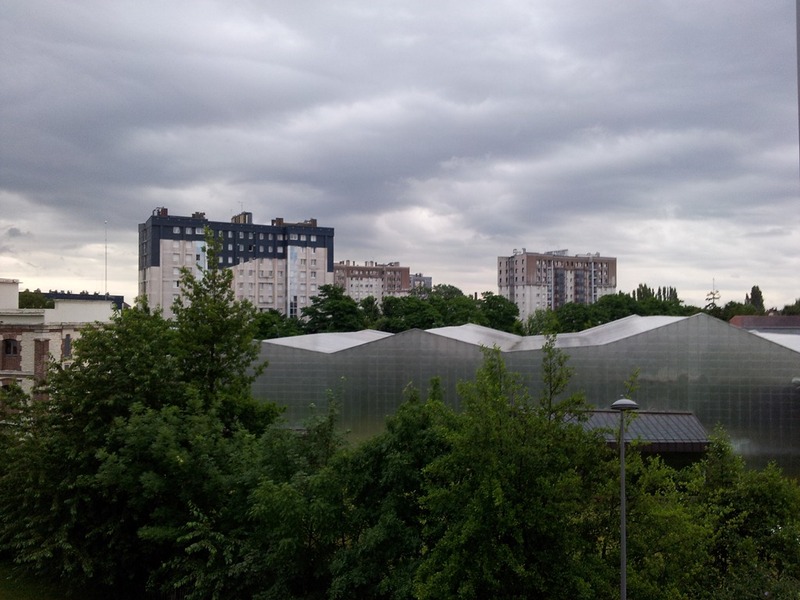 We arrived in Troyes which was fairly busy and found our hotel for the night the Ibis Troyes Centre Hotel. There were a few places we could have parked the bikes for free but decided to pay the 10 Euros to park the bikes in one space in the secure underground carpark. Although this was our longest run of the holiday at 327miles, it was a relatively easy day as we seemed to cover the distance with a high overall average speed. After unpacking and a quick shower we headed out to have a look around Troyes. We weren’t particular impressed and felt parking the bikes securely was a good move. There were quite a lot of places to eat but none were particularly cheap. We decided to eat at Restaurant Hippopotamus as it looked quite popular. It was a good decision as the food and service was excellent. We got up early again and a had a quick bite to eat in our room and then packed up the bikes. Helen managed to get a refund on the secure parking after complaining that the aircon wasn’t working properly. Apparently it had been an issue for a number of days so he refunded the parking without any fuss. 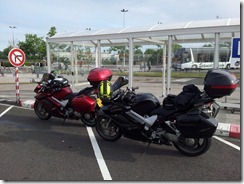 We left Troyes at around 7:30am, the roads were damp as it had rained overnight. We quickly got out of Troyes as the roads were really quiet, probably as it was Sunday morning. 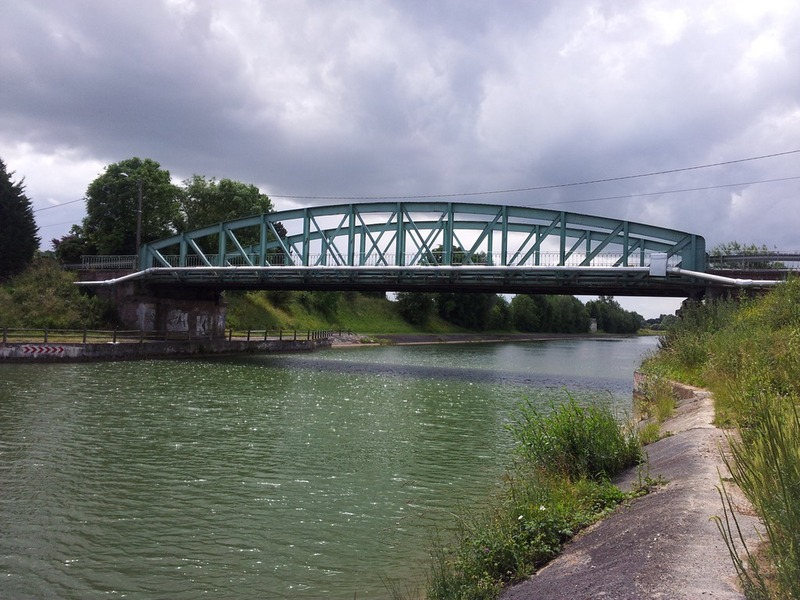 We joined the D78 and headed North for Mery-sur-Seine. Here we joined the D7 and got back into the countryside again, like yesterday. 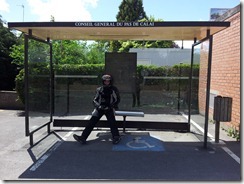 The roads now were starting to dry out and we joined the D43 and soon arrived in Fere-Champenoise. Here we joined the D9 and then the D40 as we made good time on clear open roads. We continued North on the D36 and D22, we were really now running on roads in the middle of nowhere. 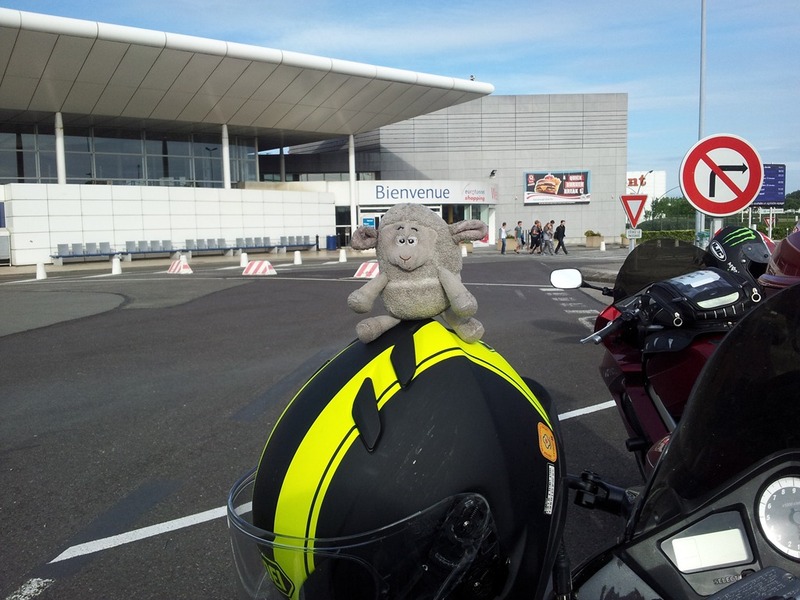 We passed to the West of Epernay and were now starting to worry about fuel as the fuel gauge started to get very low. We stopped in Darnery to consult the oracle that is TomTom. We had a petrol station on route (Intermache) about 40km away. We calculated that we could make it there and it would likely be a 24hr station if the supermarket wasn’t open. 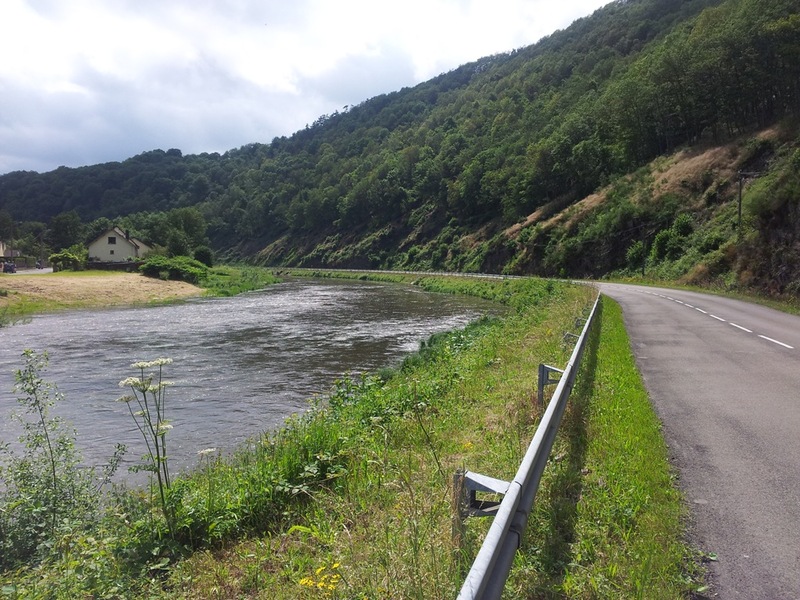 We continued on the D324 and D386, as the bikes fuel gauge hit 1 bar left we arrived on the outskirts of Fismes. We stopped at a bakers to get a Baguette for lunch and Helen also picked up some warm Croissants as well. 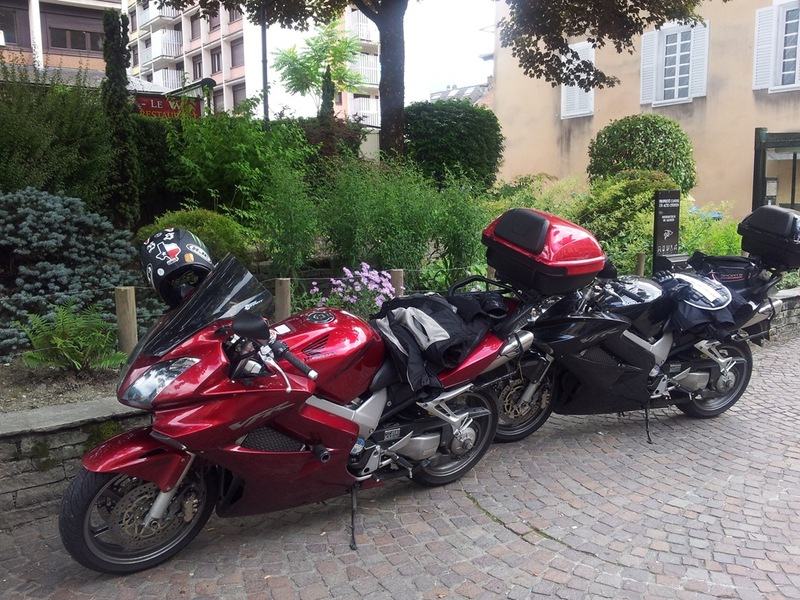 We then called in at the Intermache for fuel and then ate the Croissants. 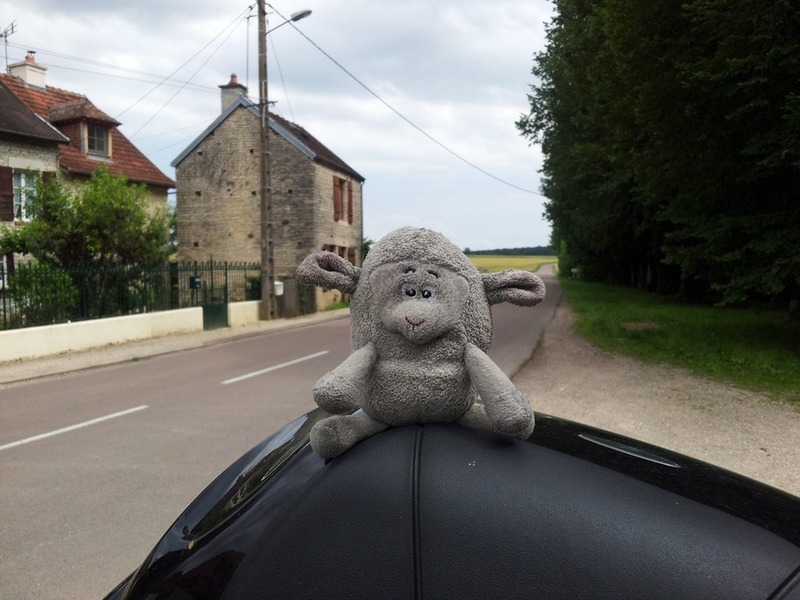 We left Fismes on the D367 and headed North for Laon. At Chamouille we passed by Center Parcs at Le Lac d'Ailette. When then skirted around Laon and joined the D26 and D692 fro Ribemont. At Ribemont we joined the D13 and continued North. At this time I was starting to continually yarn, so I was looking for a cafe to stop at for some coffee. But we weren’t really passing through any really populated areas. Just before Bohain-en-Vermandois we passed by the small village of Seboncourt. As we rode through I noticed Cafe de la Station with its door open, so we stopped. It wasn’t the cleanest or plush of cafes but it did the job. We did seem to be the highlight of the month for the owners though. We left the cafe with the owners looking on, who then continued watching until we were out of sight. We headed through Bohain-en-Vermandois on the D960 and headed along the same roads we had come down on around 2 weeks ago. We arrived in Cambrai and then headed out on the D 939. Somewhere near Marquion we were diverted off the D939 through Sauchy-Lestree and over the Canal du Nord. Here we found a quiet parking spot by the Canal to have lunch. We left on the D14 and soon rejoined back on to the D939 and headed for Arras. We passed by Arras and joined the D341 for Houdain. We continued on this road for a while and then eventually arrived in Therouanne after a brief rest stop in Estree-Blanche. Here we joined the D77 and headed into the outskirts of Saint-Omer. We easily found our hotel for the night the Etap Hotel Saint Omer Centre. We arrived in really good time today as it was only 2:30pm. We checked in and had a quick shower and freshened up. 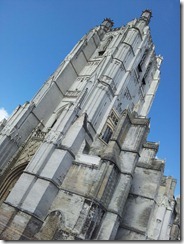 We then went out to have a look around Saint-Omer. We found a lovely black cat in the carpark that enjoyed snuggles, so Helen obliged as usual. We walked into town and found the market just finishing packing up. We stopped at one of the many cafes around the square for coffee and a Tour de France fix on the TV. 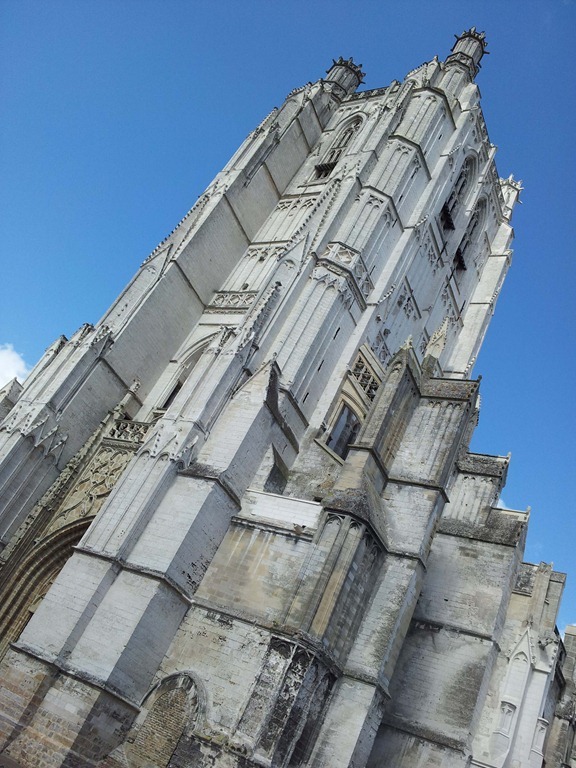 Saint-Omer itself was really nice, with a lovely Cathedral and a really nice park that we sat in to eat some pastries we had acquired from the bakers. We then headed back to the hotel and then went out later for tea at the nearby Buffalo Grill. We always try to get one Buffalo Grill meal in every year. We got up early again and had breakfast at around 6:30am at the Etap. We then packed up and left at around 7:30am and went to the nearby Super U for fuel. We set out early as we had heard that if you arrive well before time that they will usually offer you an earlier crossing for free. We left Saint-Omer on the D943 and followed that all the way to Calais. We stopped briefly on route at a bakers for a baguette for lunch. 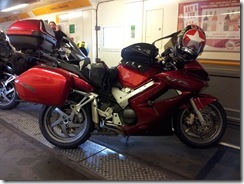 We arrived at the Eurotunnel in good time and went to one of the automated machines. Thankfully it offered us an earlier crossing so we accepted it. It took us a while to get through customs as the British passport booth actually wanted to look at our passports. We parked up briefly and then headed over to our train. 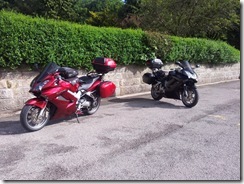 We were put on last again and we parked up with a few other bikers this time. The train set off and then braked, all the bikes moved forward so we all moved very fast to catch them. I don’t think any of them would have gone over, but it did unnerve us all. 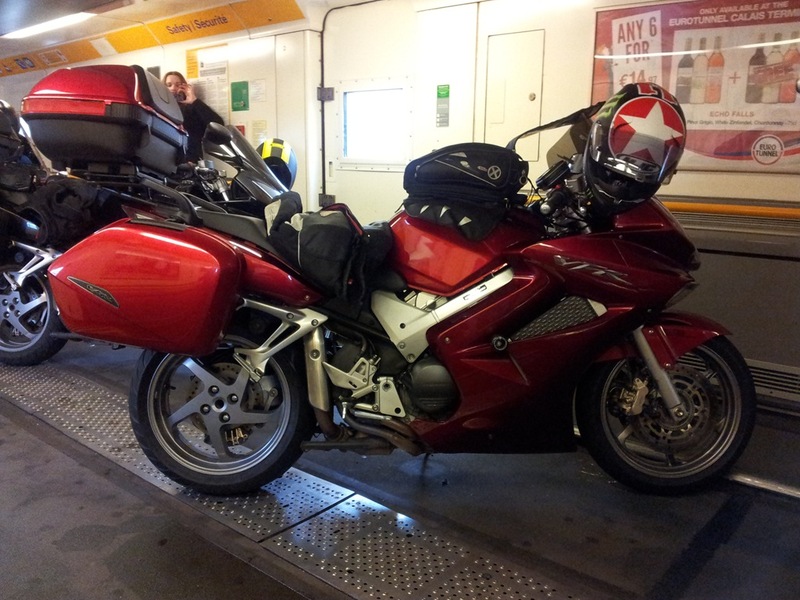 We soon arrived back in England and left the train and the Eurotunnel behind and headed for Ashford on the M20. 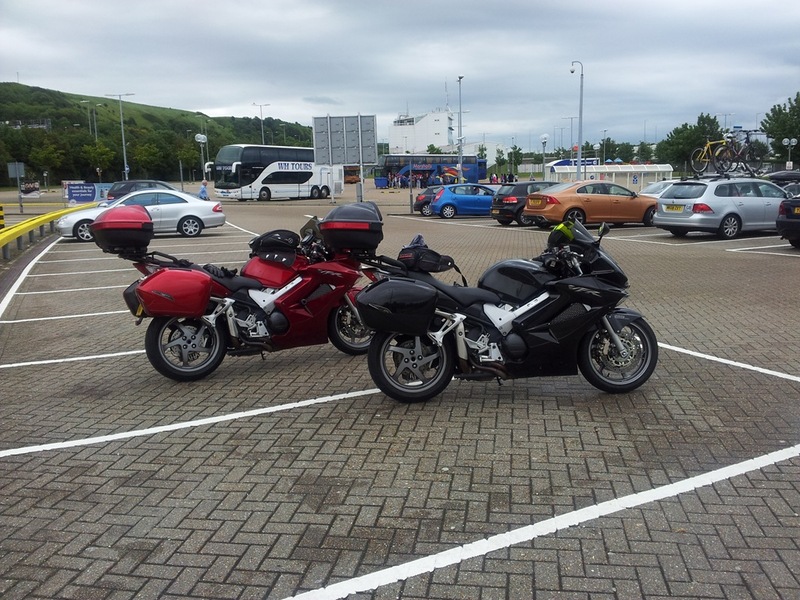 We left the M20 at junction 9 and headed over to the M25 via Royal Tunbridge Wells. We joined the M25 and I expected to come across some services. Unfortunately I was wrong and there simply aren’t any on this side. We again had to filter through tight slow moving traffic. We eventually passed Heathrow and then left the M25 and joined the M40. Once on the M40 we were able to stop at Beaconsfield Services. Here we stopped for lunch and a much needed rest. 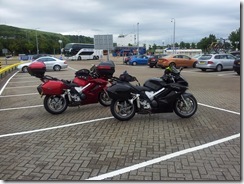 We left the services as it started to rain and then headed on the M40 again to junction 5. We then headed for Buckingham on minor roads and the A413, again bypassing Aylesbury. We passed through Buckingham and then went pas sed Silverstone again. Helen at this point was tired and struggling to control the bike. With this and the fact that it was raining we decided to head over to the M1 and head home on the motorway. We headed up the M1 and in the heavy rain the visibility was very poor, but most of the drivers were giving us plenty of room We decided not to go on the M6 and instead continue on the M1. We did have to do some more filtering at one point before we eventually arrived at junction 35a and the A616. We stopped at Wentworth Retail Park for fuel and a much needed coffee at McDonalds. We left here after a brief rest and it had just stopped raining for the first time in ages. We headed on the A616 then joined the B6106 and headed through Homfirth and over Saddleworth Moor to Greenfield. We then headed home via Lees and Oldham. Press the Play button next to Link below right to begin.